A day at the MTA Bus Fair. Given my, uh, advanced age, I have ridden in virtually every bus make that has plied the streets of NYC for the Transit Authority and later, the Metropolitan Transit Authority, since 1960 or so, from the sinuous GM and boxy Macks from the 1950s, the fishbowl GMs of the 1960s and 1970s, the flimsy Flxibles of the 1980s, to the more comfortable, though fewer-seated, models of the 1990s and 2000s. It must be admitted that bus riding is a more comfortable experience than in the past—all buses now have air conditioning. 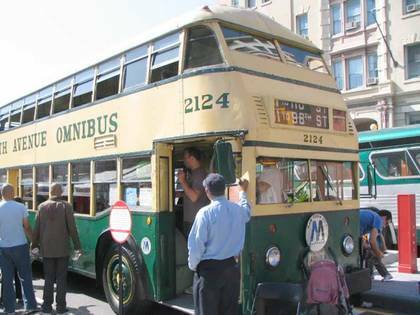 Every year in September the NYC Transit Museum trots out its collection of vintage buses during the Atlantic Antic, a street fair with an over 30-year tradition. Buses were lined up on multi-laned Boerum Place for public inspection. 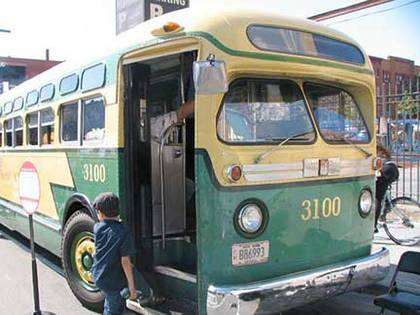 I immediately went to the first bus I recognized from my (very) youthful days, the GM Model 9098 (above), the green two-toned bus I rode on as a child. The GMs had been in use by the TA since the 1940s, but Model 5106, introduced in 1958, featured several modern elements such as sliding windows, push-type rear exit door and wraparound seating in the back. They were also the first buses to use modern fiberglass seating, as opposed to the upholstered seats that in the 1950s had come under all-out assault by vandals. The 9098s plied NYC streets, at least in outlying areas, until the early 1970s. The GM model 5101 was introduced in 1948. 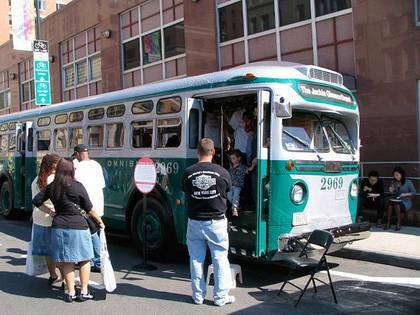 It was one of the first 40-foot long transit buses and was designed specifically for use in NYC. 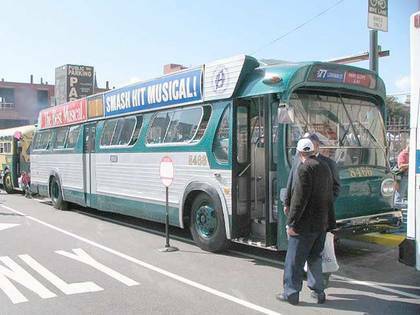 This was originally numbered 4789, but was renumbered 2969 to match the number bus Jackie Gleason was seen driving in publicity photos for The Honeymooners. The renumber was rendered in Century Schoolbook Bold, which is a reasonable facsimile but doesn’t match the unique font used by Brooklyn-Manhattan Transit as well as other trolley companies, and later the TA on buses (and I wish one of the font houses would design a complete font based on those fonts). GM Bus No. 3100 (still with the correct font on the front), model 5106, introduced in 1956, was the first air-conditioned bus in public use in New York City and continued in service until the mid-1970s, latterly in the service of the Transit Police (since folded into the NYPD). For many years double decker buses plied Fifth Avenue, which, fairly amazingly, has absolutely no overpasses, much less low-clearance ones. This one was operated by Yellow Coach, a subsidiary of GM, and was in active service from 1938-1953. Reportedly, from a resemblace (that I can’t decipher) to the famed ocean liner, it was called the Queen Mary. It was the first diesel-powered bus model in public use. 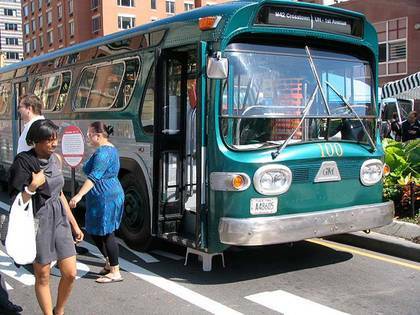 If you grew up in NYC in the 1960s and into the 1970s, you know the GM Model 5301, the inaugural “Fishbowl” bus first introduced in 1959 and, like its predecessor the GM 5106 (above), it boasted a two-tone green paint scheme at least at the beginning of its run (later Fishbowls were blue, and even later white). Never before had so much glass been used on a transit bus exterior, especially in front. Rhomboid-shaped sliding windows were introduced here, along with the somewhat annoying push button required to unlock them (which didn’t always work). The windows also had a tendency to come loose on the bottom end, and flap outward when the bus made a sharp turn. The Fishbowls reigned supreme until 1980. A later variation on the Fishbowl template was the GM Model 5303, which introduced air conditioning to the Fishbowl line, as well as the large advertising boards on both sides (I called them “wings”). Unfortunately, these buses also featured lengthwise seating, which spoiled riding the bus for me. I’d rather look out the windows when riding, not at the sullen people sitting opposite me. The 5303s remained in MTA service until 1990.